to empower our customers with Evidenced based physical therapy through education, innovative techniques, and service to manage your health. Dr. Wang speaks Chinese and English Fluent, He lived in GA most of his life, graduated from Emory University. 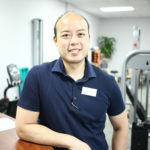 His career highlight is Dr.Wang is certified crossfit trainer, he specialized in dry needling and osteopractic diploma. Dr. Wang treats lots of power lifters, and seeing many sport injuries. Dr. Wang has two boys who keeps him busy, his Youngest son was born last December! Dr. Lee is from Korea, studied in US to obtain his doctor of physical therapy to practicefew years back. 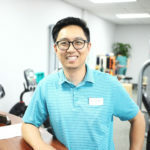 Currently Dr. Lee is staff therapist at Newcare Physical Therapy. Dr. Lee brings 16 years of sports medicine and orthopedic experience to our practice. Dr. Lee is formal trainer/therapist who used to treat professional baseball players (Hwan ha eagles, Samsung Lions). He has learned and done many different manual techniques over the years. Dr. Shin is one of the few Certified Titleist Performance Institute Medical Clinician level 3 which is the highest certification that you can obtain from TPI. 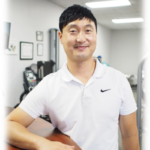 Highlight of his career is Dr. Shin has been performing Integrative Dry Needling since 2011, worked with chronic pain and sports medicine/trauma cases for more than 8 years. Currently overseeing some golf pros and former professional athletes. He enjoys playing golf and spending time with his two kids. 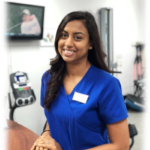 Sonal is board certified Licensed Physical Therapy Assistant in state of Georgia. Sonal has been working in acute care and hospital settings and current also working in aquatic therapy elsewhere. Currently Sonal is part time employee at Newcare Physical Therapy managing patient care with variety of conditions. Some of her career highlights are treating acute orthopedic conditions at Formal Emory Eastside Medical Center over 5 years. Sonal has two kids and very active with her profession working in two different area to keep her busy.